My name is Steven Eastwood and I operate the Lawnkeeper Halifax and Keighley area. I have been a Head groundsman at an Independent School for several years and have my qualifications in Horticulture and turf care. I cover Halifax, Keighley, Skipton, Haworth, Silsden, Steeton, Elland, Brighouse, Settle, Sutton in Craven, Clapham, Grassington, Hellifield and the surrounding areas. 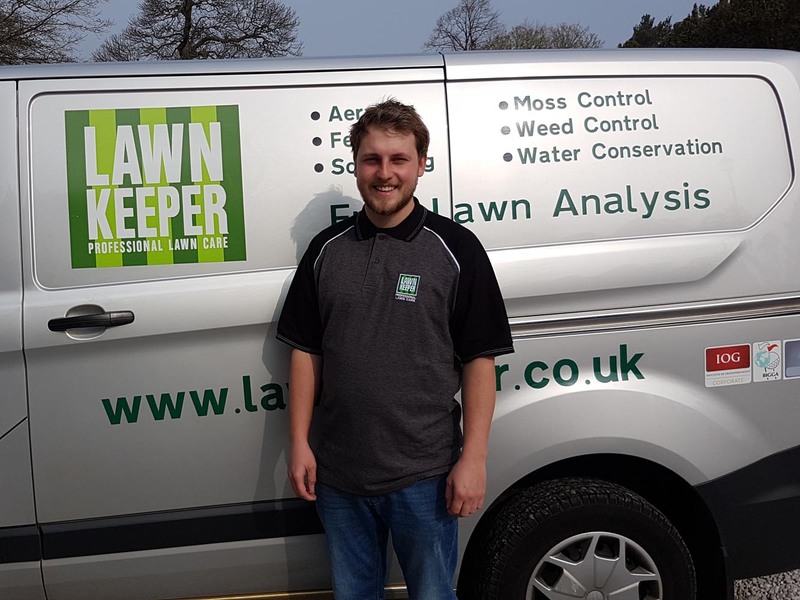 As your local Lawnkeeper professional living in Keighley, I take pride in delivering a reliable and friendly customer service. With no two lawns being the same, this includes preparing a detailed, free lawn analysis to ensure you are aware of your lawn’s individual needs. This and the use of high quality, professional products and machinery at the appropriate time of year, will ensure you have a lush green lawn to be proud of. When treating a boggy lawn, the first step is to figure out precisely what’s causing it so that you can apply the right treatment. In our experience, waterlogging usually relates to issues close to the surface of the lawn, such as compaction, thatch or hydrophobic soil. These issues are relatively common in British gardens, and they don’t have to cost the earth to put right. Barbecues, parties, garden games, pets and kids …the more you enjoy your grass, the higher the risk of soil compaction. Human foot traffic and the tracks of a lawn mower will naturally pack your soil down over time, and if the soil molecules get too tight, you can end up with dense ground that can’t absorb enough rainwater. 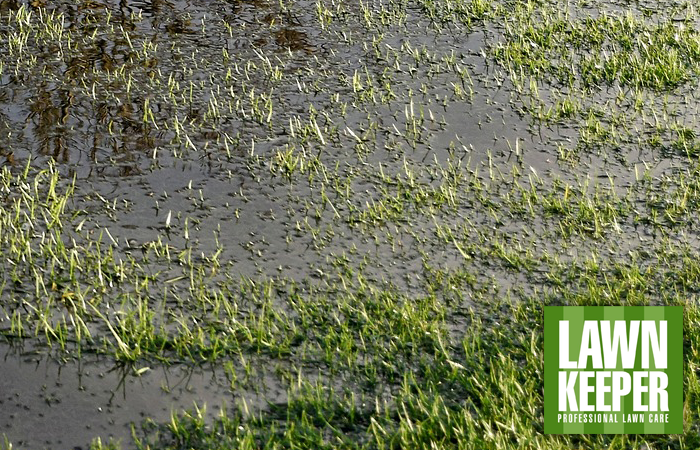 Waterlogging isn’t the only problem caused by soil compaction – it also stops roots from growing properly, which can lead to yellowing, nutrient-starved grass that lasts all summer. At Lawnkeeper, we typically treat soil compaction with a professional aeration and sometimes a wetting agent. A wetting agent will bind to the compacted soil and make it easier for water to pass through to the roots below, while aeration forces holes into the earth so that precious nutrients, moisture and air can reach the grass roots. Thatch is a common problem in lawns that have been overfed with DIY treatments. Thatch is defined as a build-up of dead plant material just beneath the surface of the soil. Dead and rotting plant debris is a perfectly natural part of the soil in every garden, but if it builds up in localised clumps called thatch pockets, it becomes a serious issue. Underground thatch pockets hold rainwater like a sponge, creating the perfect climate for a whole host of lawn diseases and pests to take root. A thatch pocket also won’t drain as swiftly as normal soil, so any grass roots directly beneath it get starved of moisture. In dry weather, grass with a thatch problem feels spongy underfoot, making it easy to identify, but at this time of year, the whole lawn can feel soft with the wet weather. If you’re looking out at a confusing patchwork of puddles on your lawn that don’t match up with where you’d expect bogginess to occur, there’s a good chance that thatch is the source of your boggy lawn problem. The best way to deal with thatch is to tear it out of the soil using a scarifier. Scarification leaves your lawn looking rough for a short while but can help free your lawn from harmful levels of thatch, so it’s worth considering. 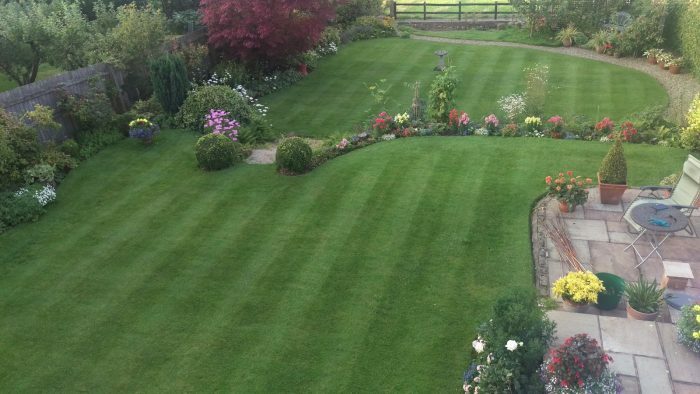 The best way to check if you could benefit from a scarification treatment is to book a lawn analysis – one of our lawn care technicians can take some soil samples and talk you through what’s best. Hydrophobic soil is often misdiagnosed as soil compaction. The symptoms are similar (rainwater beading on the surface of the lawn), but the causes, and subsequent treatment methods, are very different. When a garden has suffered a severe toadstool infestation, the spores that naturally descend from a mushroom cap can clog the soil directly beneath, and this spore-clogged soil will reject any moisture thrown at it. Because the spores lie in the soil itself, no single treatment can cure hydrophobic soil on its own. The correct solution is a combined treatment of wetting agents, top dressing, aeration and bespoke feed & weed solutions. 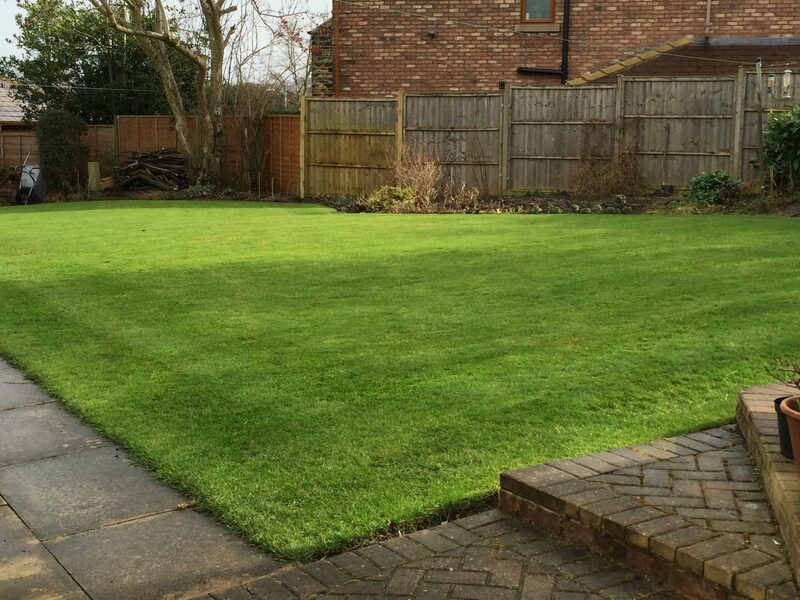 If you want a lush green lawn with good drainage and strong roots, give us a call on 0845 0945 363. We’ll use our expert knowledge to identify and repair your boggy lawn’s underlying problems in time for barbecue season. For most gardens in the UK, lawn moss is just a fact of life in early March. Months of low-lying winter sun have left large patches of the lawn in shade for most of the day, the grass plant itself has been close to dormant, and the soil has been very damp …and when you combine shade, damp soil and weak competition from neighbouring plants, you almost always get moss. So, what are the best ways to fight off this common garden problem? At Lawnkeeper, we use a combination of spray-based and mechanical methods to safely control moss and get lawns ready for spring. Lawnkeeper will spray a liquid moss control on your lawn. While there are lots of chemicals on the market that can be used to weaken moss, at Lawnkeeper we use iron sulphate-based treatments wherever possible. Not only is iron sulphate completely safe for humans and pets, it also delivers a double-whammy of moss control benefits, weakening moss and strengthening the surrounding grass in one move. Lawn treatments with iron sulphate can make a lawn’s soil slightly more acidic, which helps to keep other problems like worm casts under control. As with most spray-based treatments, iron sulphate needs to be applied in the right dosage, with the right equipment, so it’s always best to get a professional to handle the job. At Lawnkeeper, our lawn care technicians are certified in the safe handling and application of herbicides (PA1 and PA6A), and we’re experts when it comes to moss control. Moss doesn’t ‘take root’ in the traditional sense; instead, it grows on the surface of the soil, filling the gaps between the individual grass plants that make up your lawn. To pick the moss out of your soil without disturbing the surrounding grass, you need a scarifier. Scarifiers are machines with sharp thin blades that rake between the blades of grass in your lawn, stripping the moss and thatch out of your lawn without causing long-term lawn damage. 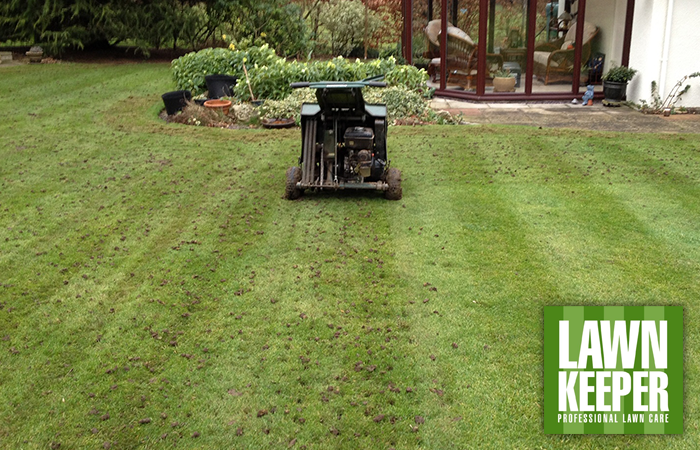 At Lawnkeeper we use our professional scarifying machines to remove as much moss as possible, but still leaving you with a healthy-looking lawn. After the bulk of the moss has been removed from your lawn, we usually follow up with a feed & weed treatment. 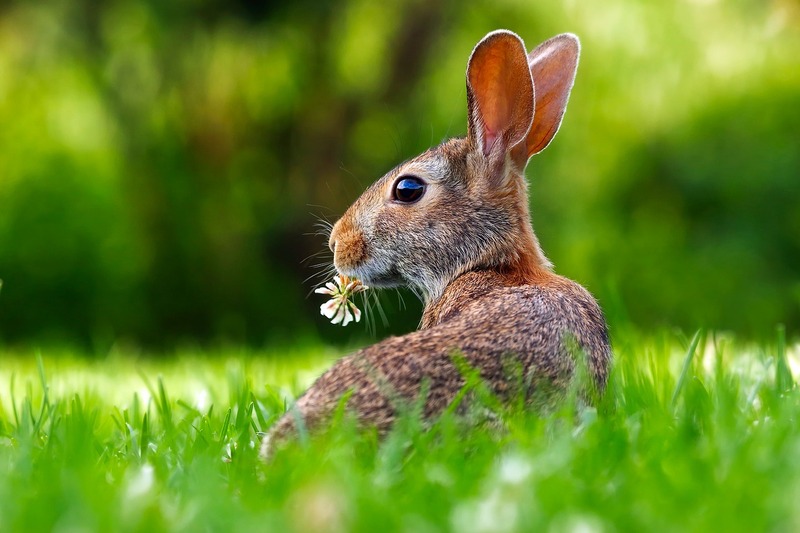 We adjust our feed and weed treatments with the seasons to ensure that your grass gets precisely what it needs, at the right time, to grow and fight off future lawn problems. You can never get rid of moss completely. Moss spores are in the air all around us – when the conditions are right, moss will grow in your lawn. You can, however, reduce the odds of it taking hold, by keeping a healthy, well-drained lawn. 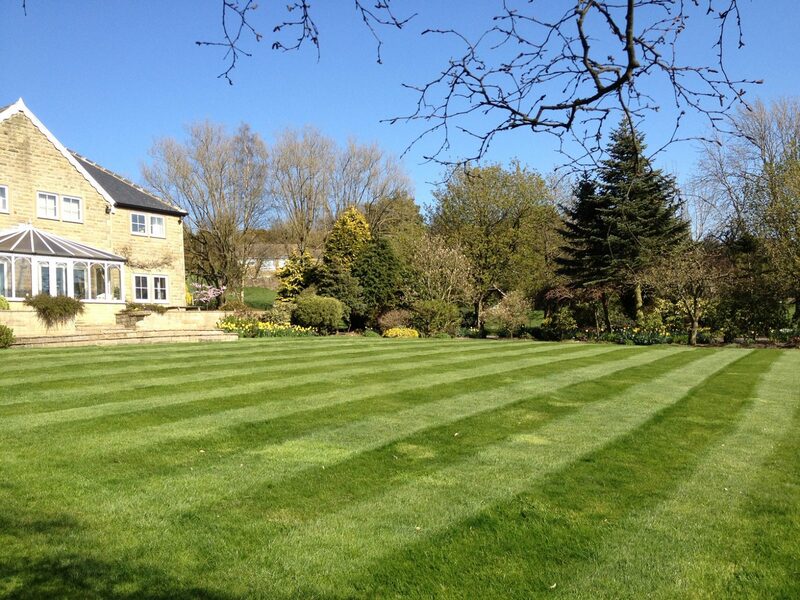 If you’d like to know more about keeping your lawn looking its best, give your local Lawnkeeper technician a call. We’ll visit you for a free lawn analysis and show you how to fall in love with your lawn again.